As the only cloud software provider to support the entire social good community, Blackbaud powers an ecosystem of good among nonprofits, foundations, corporations, individual change agents, and educational institutions. What does that mean for you? 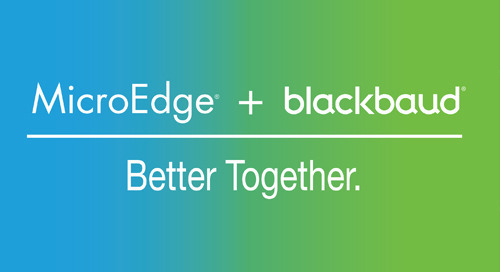 Blackbaud customers have access to the most innovative capabilities in the social good technology space, specifically created for this unique audience that is united in its desire to achieve social change. We’re thinking about the future, and we know you are, too. That’s why our team of over 600 engineers is constantly innovating and has developed a comprehensive solution for foundations that addresses your organization’s current needs as well as those you anticipate in the future. Our solution will your organization to give strategically, communicate effectively, and operate efficiently, all of which sets you up for success as global needs and demands in the social sector evolve.